Create a table with a category field and a field with aggregated numbers – for example, Continent and SalesAmount. Tip: For the category, fields with eight or fewer values work better. See Tips for good pie charts. On the Design tab > Other Chart > Pie. Power View creates a pie chart with the legend on the right. In the lower half of the Field List, the category field is in the Color box and the aggregate is in the Size box. You can’t copy pie charts from a Power View sheet in Excel to a regular Excel worksheet. 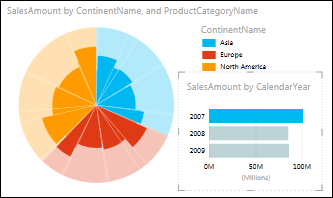 You can add a pie chart to an Excel worksheet. Power View pie charts don’t currently have data labels, so that option is grayed out on the ribbon. You can add another category field to get slices within the colors, as in the above example. Drag a category field to the Slices box. Drag another category field to the Color box, under the field that’s already in that box. The pie chart looks unchanged. Double-click one of the pie colors. The colors of the pie chart now show the percentages of the second field, filtered for the pie color you double-clicked. To go back up, click the arrow in the upper corner of the pie chart, next to the filter icon. Read more about drill-down visualizations in Power View. Fewer than eight slices in each color. Pie charts are good at providing approximate values in relation to other values. Because they don’t provide the side-by-side comparison of bar and column charts, it’s harder to compare values precisely. They always show values as a percentage of the whole – the whole pie is 100%, so every color is a percentage of that.